Visualspace has been working with ABP for quite a while now. Visualspace developed for ABP (which stands for Aluminium Building Products) their corporate identity, website, and a number of product brochures. Twenty-five years of experience in façade systems and aluminium wall cladding have made ABP the leading expert in the field. With over half a million square meters of surface material for factories, office towers, subways, sport facilities and residential buildings completed, ABP has an enviable track record for efficiency, quality and cost-effectiveness that few in the industry can match. ‘Some of the aluminium panels are installed on buildings taller than threehundred meters. You definitely want to be sure that the panels will stay where they are’ says Luuk Frank van Heerde of LFvH, ABP’s branding partner in Taiwan. 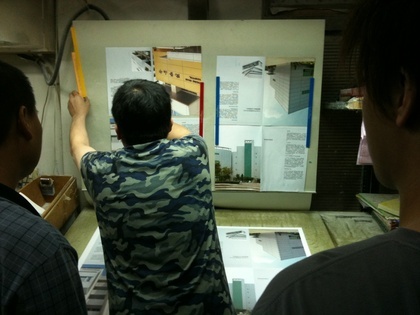 The photograph shows a local printer tackling Visualspace’s artwork.